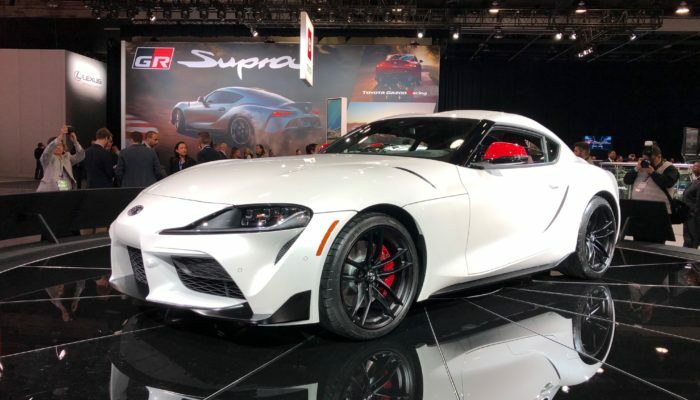 Toyota offered the first official look at its top-line sports coupe Supra. After a 17-year hiatus, Toyota President Alio Toyoda traced the new Supra design to the 1967 Toyota 200 GT with its curved lines, long hood and short overhangs. The RWD car will be powered by a turbocharged 3.0-liter in-line six delivering 336 horsepower. Mated to a 6-speed automatic with paddle shifters, Toyota claims the car will turn a 4.1-sec. 0-60 time. Reports confirm the engine is based on the BMW in-line six. The car has a double-joint spring strut front suspension and multi-link rear. Toyota describes as “extremely rigid” the front-suspension subframe and control-arm-mounting points. The vehicle also features multi-link rear suspension with Brembo brakes all around and four-piston fixed calipers up front. Fernando Alonso 2019 Le Mans driver for Toyota was also on hand to present. Supra will be the Toyota NASCAR entry in the 2019 season.